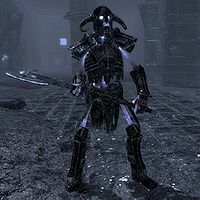 Summons a Wrathman from the Soul Cairn for 60 seconds wherever the caster is pointing. Conjure Wrathman is an expert level Conjuration spell that summons a Wrathman to aid you in combat. The Wrathman is undead, and thus subject to spells that affect the undead. The Wrathman has the highest health of any summoned creature. This page was last modified on 14 November 2016, at 23:09.